For nearly six decades, Vaughan & Asbury’s General Ophthalmology has offered authoritative, state-of-the-art coverage of the diagnosis and treatment of all major ophthalmic diseases, as well as neurological and systemic diseases causing visual disturbances. It is recognized world wide as essential reading for medical students, ophthalmology residents, practicing ophthalmologists, nurses, optometrists, clinicians in other fields of medicine and surgery, as well as those in health-related professions. The Nineteenth Edition builds on this tradition of excellence by offering a new full-color presentation, an increased number of color photos, and cutting-edge content additions and updates – to deliver all-inclusive coverage that encompasses pathophysiology, basic science, and the latest clinical perspectives. 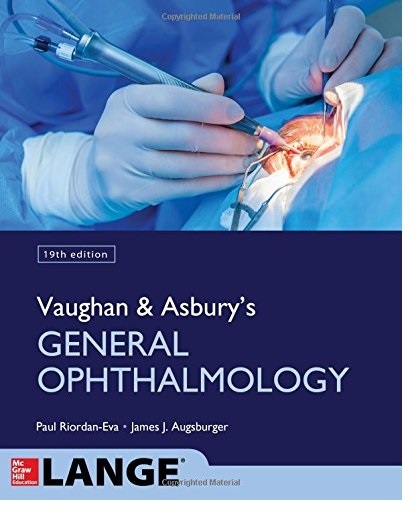 If you are in need of a concise, up-to-date, and well-written overview of the basics of ophthalmology, Vaughan & Asbury’s General Ophthalmology, Nineteenth Edition belongs on your desk.